Olt Motor SRL was set up in 2006 taking over an important part of the activity of a company set up in 1991 and its main object of activity is the manufacturing of metallic lathes and component parts thereof. Within our company we make both mechanically welded parts as well as chip removing processed parts on numeric control lathes but also on conventional lathes such as mills, lathes, drilling machines, grinding machines. We also have welding plants MIG, TIG/WIG, MAG. Our company has implemented quality management systems ISO 9001/2008, ISO 14001/2008 and ISO 18001/2008. From the very set u, Olt Motor had clients with big reputation on the market from Romania such as Semanatoarea, Tractorul Brasov, Aro Campulung, Alro Slatina, Altur Slatina and others. We have 5 lathes with numeric control OKUMA brand purchased from GreenBau Tehnologie. Starting from 2008 we decided to equip with numeric control equipment in order to increase our processing capacity and precision. Thus in that year we resorted to GreenBau which delivered us the first OKUMA lathe brand LB2000. After this first experience with GreenBau and OKUMA lathes, throughout the next years the investments in purchasing OKUMA machines increased, being very satisfied with their reliability and precision as well as with the services supplied by GreenBau Tehnologie. Thus GreenBau is fir us not only a supplier of equipment and services, but also an exceptional partner by the services offered along time in key moments, decisive services in carrying out the ongoing projects or projects in incipient stages. In our opinion the advantage of OKUMA is the rapidity of implementing designs from drawing to actual performance of the part, due to the simple and very effective programming system. 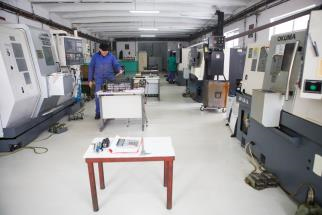 The disadvantage of these machines would be the price, price that sometimes is higher than the one of other similar machines manufactured by the competition but it is reflected in the quality of the services offered by GreenBau and also in the high precision parts made on these machines. To the success of Olt Motor, OKUMA machines have essentially contributed by the quality of the performed parts as well as the excellent communication we have with GreenBau Tehnologie personnal. Due to these works we envisage that the next acquisitions of equipment with numeric control should be also OKUMA brand from the distributor from Romania, GreenBau Tehnologie company. Along time, we have had small issues in our collaboration with GreenBau, issues that were quickly settled by good communication. I want to thank the personnel of GreenBau for the good collaboration we have had with them and for the promptness they answer to the requests that I and my colleagues send to them and I wish you good luck further on in the activity you perform. 17 bis, Gr. Alexandrescu st.